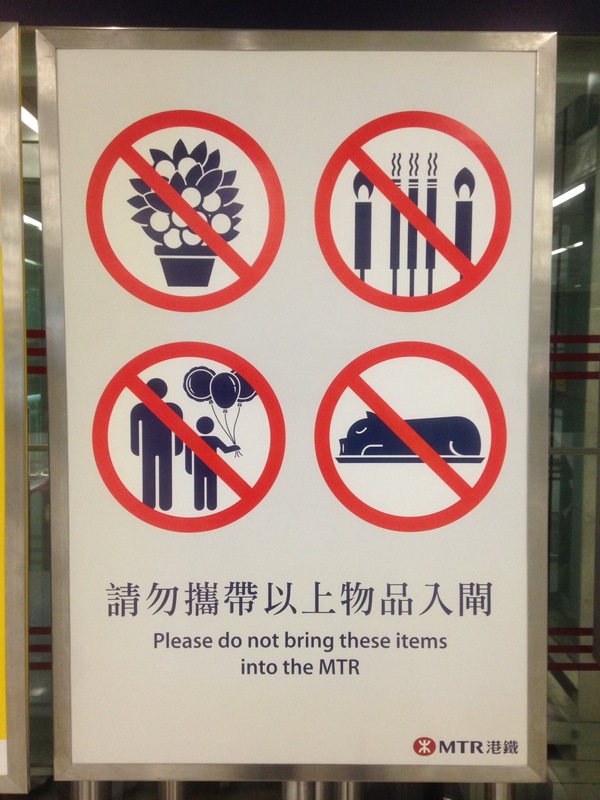 It’s Chinese New Year New Year and the MTR is showcasing some new “don’ts” for the holiday season. Passing through the MTR recently, you might have noticed signs like this around each station. When I saw, I immediately thought to myself “special rules for Chinese New Year.” Let’s take a closer look at what we see here. I kind of figured this was some kind of super precautionary measure, just in case one of these wanders on to the track and gets sucked into some machinery. But, apparently, the threat is real though. Back in 1996, a “rogue Minnie Mouse Balloon” made it’s way onto a track and short circuited all the lines from Admirality to Quarry Bay. So, I can understand this one. Even the briefest encounter with Chinese New Year in Hong Kong, will make you wonder, “what’s with all the orange trees?” They are a fairly integral part of traditional Chinese celebrations for the New Year. This comes from the similiarity of the Chinese word for “tangerine” to the word “luck”. Also, the Chinese word for “orange” is similiar to the word for “wealth”. Therefore a gift of orange or tangerine tree is like wishing someone “an abundance of happiness and prosperity”. No Candles and… Insense Sticks, I think? It goes without saying that the last thing you’d want on a crowded rush hour MTR is someone lighting up candles or incense… I think those 3 sticks in the middle are incense. They could just as easily be Roman candles or tiki torches from the look of it. One would think this would fall under general, year round common sense, “don’t light fires on a train”. Given that there’s an actual sign being put up for it, it’s hard not to imagine that some buffoon must have tried this at some point or another. Hence, the need to warn others. What Chinese New Year celebration in Hong Kong is complete without a Cantonese style roasted pig. This is, by far, one of my favorite traditional dishes in Hong Kong. If someone has a roasted pig served up, you can be sure that I’m geting seconds, and thirds, maybe fourths. But what gives about not letting these on the MTR? Of course we all know that eating and drinking is not allowed on the MTR, but carrying food frm place to place is usually not an issue. While I could imagine someone getting impatient and ripping into one of these roast pigs right ont he MTR, I doubt that would be very feasible. I guess one can imagine it must be because these are already kind of awkward to carry. You have to carry them flat, can’t just plop this on a seat. Plus, if it’s not a suckling pig you’re carrying, that mofo is going to be one big slab of meat. I’d imagine it would only be a matter of time before the guy holding this, loses control and drops it all over some tai tai’s brand new Chanel outfit. In either case, we wish you safe travels on your holiday, whether you’re heading on the MTR to visit family and friends or taking a different mode of transport. Happy year of the Rooster to all! Gong Hei Fat Choi! Previous Previous post: Disney’s… Waterworld?